We’re rapidly running out of daylight on the season, and the title is still undecided. This puts even more pressure on the referees than they usually face. Any mistake could impact who wins the title. Liverpool play at Norwich on Sunday, with Andre Marriner (above) in the middle. Poor Andre has not had the … steadiest of seasons. Let’s hope he’s firing on all cylinders Sunday. Manchester City, who recently lost to Liverpool, are making up ground in their games in hand. 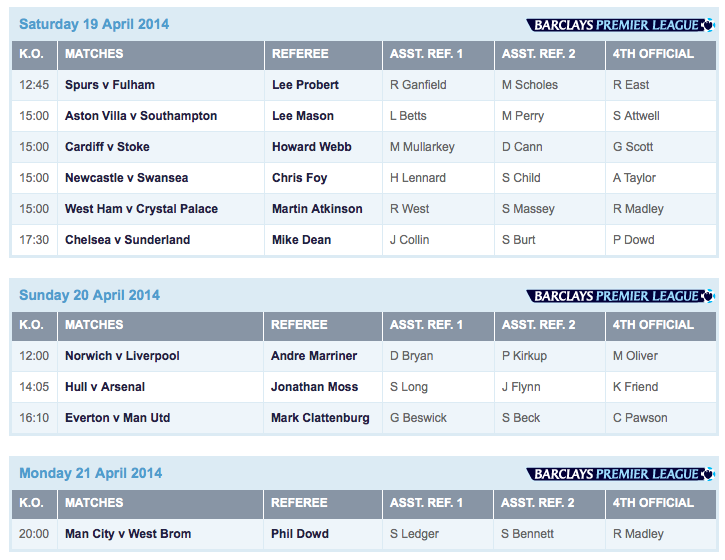 They host West Bromwich Albion, and Phil Dowd is the referee. Everton are ever so close to Champions League football, and they host Manchester United on Sunday. Evertonians are not big fans of Mark Clattenburg, but he’s on such a roll that he’s a no brainer for a defining match. He’s had a lot of those this year. I myself have a bit of a dilemma: my personal favorite, Lee Probert, is refereeing my Spurs when they play Fulham at White Hart Lane. Hopefully, he won’t give me a reason to hate him. As for Harry Lennard Watch (which I guess is a thing now), he’s assisting Chris Foy at Newcastle.